It is cool to see the trickle-down effect at work. 5 years ago, if you wanted to buy a bearing equipped manual action framelock flipper you either forked over the dough for a custom knife, or it simply didn’t exist. 3 years ago, if you wanted one you had to shell out the $225 for a Zero Tolerance 0560. Today, you can get into bearing equipped manual flippers for as little as 30 bucks. I must admit that I was a touch skeptical when I purchased a CRKT Swindle. I figured at that price something definitely had to give. I was wrong. What an awesome blade. So when CRKT announced the release of a plain stainless steel handled Eros I was pretty confident that it would be worth my while. I wasn’t so crazy about the baroque handle or the $100 price tag of the original Eros. At around $45, this plain version is much more in line with knives like the Skyline, Leek, Zancudo, and Rat II… all blades I would consider to be rockstar budget knives. Like the Swindle, the Eros SS is a manual action flipper designed by Ken Onion and equipped with an IKBS bearing system. Where it departs from the Swindle is that it’s a little more traditional in its design and appearance. The Eros comes in two sizes: large (the subject of this review) and small. The large Eros SS has an overall length of 6.94″, a 2.84″ blade, and weighs 3 ounces. The small Eros SS has an overall length of 4.96″, a 2.03″ blade, and weighs 1.5 ounces. For me the large Eros is the way to go. Frankly I can’t imagine using a smaller version of this knife, as this size is about perfect for me to easily manipulate the blade open and get a full grip. The small version is, well, really damn small. That is fine I suppose for some applications, but since the Eros is such a delicate knife to begin with I really appreciate the larger version. CRKT bills these as gentleman’s folders and every day carry (EDC) knives, and I used mine for light EDC work. The blade of the Eros is a almost a sliver of stainless steel. This is among the most delicate of blades I have handled, which is fine if you mostly use the knife for letters and boxes as I have. My Eros has sat on my desk at work for months now and gets plenty of work opening the daily deluge of mail. The ultra fine tip and gentle curve to the belly is perfect for getting under the fold of an envelope. CRKT went with a thin hollow grind with a long swedge and deep satin finish. Just like on the Swindle, the spine of the blade has been rounded a la Chris Reeve Knives. I love the extra attention CRKT has spent on the blade. It’s hard for me to capture in photos, but this is a beautiful little blade and is perfect for light use. Of course great care needs to be taken with the tip. This isn’t something you will want to process a deer with or use to remodel a kitchen. 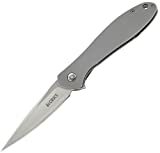 The Eros SS runs AUS8 blade steel, which is par for the course for a small knife at this price point. I haven’t done anything too extreme with my Eros, but the blade has busted open plenty of boxes, cut lots of paper, and it holds up well to that kind of use. It is extremely easy to sharpen and maintain and is heat treated to 57-58 HRc. The satin finish should hold up better against rust better than the bead blasted finish we often see this steel come in. No complaints here. The Eros has full bead blasted stainless steel handles, leaving the knife with a faux titanium appearance. This is a simple handle design with 2 stainless steel standoffs, a slender lockbar cut out, and screw together construction. There is a lanyard hole, which could be useful if you decide to remove the pocket clip. All said handle construction is great. CRKT did not get fancy 3-D machining the handle like on the Swindle, but the simple handles function well and allows the eye to wander to the beautiful blade. The Eros is a small but comfortable knife to use. I am able to perch all 4 fingers on this handle, with maybe a 1/4″ or so to spare, so it should accommodate most people. There is no jimping or texture to speak of, save for 4 notches on the flipper tab. Some may bemoan the lack of texture on this handle, but for light duty this is fine. I have had no trouble using this knife for light EDC tasks around the house and at my office. The Eros has a pocket clip situated for right side tip down carry only. I have complained pretty heavily about most of Ken Onion’s funky pocket clip designs in the past, and this Eros clip still leaves something to be desired in my book. It isn’t terrible, but I would prefer a more standard clip. That said, this clip functions fine. It feels somewhat thin but is actually very secure slipped to the pocket of a pair of dress pants. Although the Eros isn’t ridiculously heavy, being a solid steel framelock it is a denser knife and I do notice it a little in pocket. The Eros SS is an IKBS equipped manual action flipper. The detent is well tuned, and the blade pops open reliably with the push of a finger. CRKT has done a great job with their IKBS flippers and I am no less impressed by the action of the Eros than I was on the Swindle. Today we may take stuff like this for granted, but I think the fact that for $45 or so you can get a nice bearing equipped manual flipper designed by a world renown custom knife maker is just incredible. For lockup with have a stainless steel frame lock. Mine engages about 95%, and is very secure. There is no blade play. There is not much as far as a relief in the handle to disengage the lock bar, although there is a little scalloping for your thumb to grab on to. This isn’t a problem, but is another reason why I prefer the Large Eros over the Small version. Any smaller than this and it just gets kind of futzy to deal with. It is worth mentioning that the blade is perfectly centered. I can’t help but compare this knife with the stainless steel Leek. As many of you know, Ken designed the Leek for Kershaw many years ago, and it has endured as a top budget friendly EDC choice to this day. It is also a stainless steel framelock flipper (although it does come in a liner lock version as well). I like the Eros a little more than the Leek. The addition of a satin finished blade with a slight belly and slightly reinforced tip is nice. I also much prefer the unassisted opening of the Eros over the spring assisted Leek. I like how the Leek is made in the USA, and would say that the build qualities are close to on par. Another obvious comparison would be the acclaimed CRKT Swindle. Perhaps my favorite knife from CRKT to date, I think the Swindle is a little more interesting than this knife with its 3-D machined handles and swayback styling. Functionally, the Swindle is actually a little bigger and stouter than the Eros, although both should be considered EDC / gent’s folders. All said, the Eros SS is a winner. This is more of a classic design from Ken, but it still has some of his flourishes. Those pesky pocket clips can always be complained about, but beyond that I have a hard time finding fault with the Eros SS. The tip is very delicate, and for that reason this is not a budget knife that can take a beating like my Zancudo or Rat II. If you are looking for a more traditional gentlemanly high value framelock flipper then the Eros SS is well worth considering. Mine has performed admirably and I am impressed with how well made it is. For $45 you really cannot go wrong. I recommend buying the CRKT Eros at Amazon or BladeHQ. Please consider that purchasing anything through any of the links on this website helps support BladeReviews.com, and keeps the site going. As always, any and all support is greatly appreciated. Thank you very much. Excellent review. Tells folks just what to expect. I agree so precisely with Dan’s impressions about this nice little gent’s blade that I have nothing substantive to add — Just a good old fashioned +1. Thanks, R.D.! Interesting, yeah mine engages pretty late, but still plenty secure in my book. Perfect centering and no stick so I’ll take it. Great review! I love Ken Onion’s designs; I own a Kershaw Shallot (the larger version of the Leek) and it’s an absolutely beautiful knife. Thank you, JM! Glad to hear you like your Shallot! I have to say – I’m liking Ken Onion’s move toward simpler designs. I have the swindle and like it quite a bit. I can’t see myself buying this because I probably wouldn’t carry it over my swindle, but I really do appreciate what he and crkt are doing vs. their more noisy designs of the past few years. I agree. These restrained designs are nice and well worth considering. The Swindle is in a league of its own. Enjoy it in good health! I managed to score a black one of these in a contest a while back and I like it. Now, it’s too small for my XL-paws but it’s a great knife for the money and if you can deal with the size – a great catch. Thanks, Lew. I agree – it’s a small knife. Can’t imagine how someone could really use the “small” version of it. Still well made and a good value for money.